More than 150 people donned blue and purple hats on a seven-mile walk to raise awareness for Cancer Research UK today. It was a windy but bright start at Roker Pier afternoon as Ann Walsh kicked off the trek to The Groyne in South Shields. The walkers get ready to leave Roker earlier on today. The second annual Pier to Pier walk aimed to raise awareness for Cancer Research and the determined group of around 150 walkers are hoping to raise £400. Organiser Ann Walsh said the group decided to bring the walk back for a second year after it made its debut last March, with the end point changed to Conversation Piece, the statues near to the Little Haven Hotel in South Shields, from the seafront skate park last time. It will be followed on from its main event, the Relay for Life, which will be held on the weekend of April 13 and 14, with many of the teams taking part in that so joining in with the walk. Ann said: “The atmosphere was really good, but it was cold, and it helps raise awareness for Cancer Research UK. 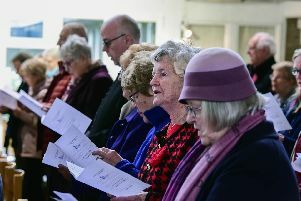 Organisers said 150 people took part in the event. “We have already got £22,500 in the bank and this event will tip over to £23,000 and there’s more to come in. “It’s quite nice to see people get together, as they often don’t see people the rest of the year, and there is so much support in the area. One group of walkers after they crossed the finishing line in South Shields. One of the walkers taking part was David Meikle, who works with organiser Ann at Epinay Business and Enterprise School. He said: “She does an awful lot for fundraising and amazing work for Cancer Research. “I think this is a fun and healthy way to raise awareness. 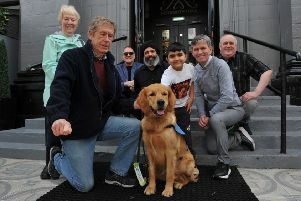 Guide dog Deva pays visit to the South Shields venue where customers have helped fund his training. Also among the walkers was Jean Finlay who lost her husband to cancer. She signed up to do the walk alone but met another lone walker, Karen Foster, and the pair decided to walk together. Jean, 65, of Sunderland, said: “I lost my husband Barry to cancer so I try do what I can to raise money. “I’ve done the St Clare’s walks before, but they’ve closed now. “I saw this one advertised and decided to come along. Cash raised during the walk will be donated through this year’s relay, which will be staged at Monkton Stadium in Jarrow. The relay, started by Ann 13 years ago, has raised more than £600,000 for the charity. It sees teams of fundraisers taking it in turns to continuously walk round the track, with 32 groups already signed up to join in. To take part in the March on Cancer Walk email annwalsh11@aol.com.